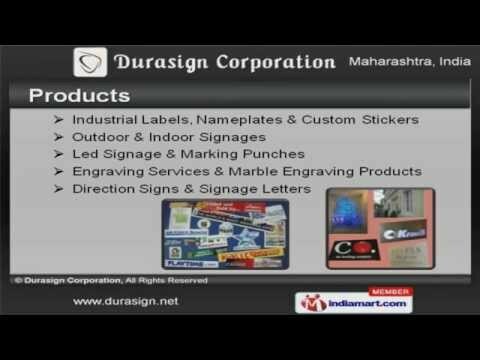 Welcome to Durasign Corporation. Manufacturer and Exporter of Signage Marking and Engraving Products. The company was incepted in 2004 at Pune. We serve to Automobile, Electronic and other industries. Tata Motors Limited and Mercedes Benz Limited are some of our prestigious clients and we are backed by CAD/CAM software and onsite support. We offer a wide assortment of Industrial Labels, Led Signage and Marking Punches. Industrial Labels, Nameplates and Custom Stickers offered by us are best in the industry amongst others. Our Outdoor and Indoor Signageâs are in huge demand across the global markets. Led Signage and Marking Punches are available with us at cost effective prices. We also provide Engraving Services and Marble Engraving Products that are a class apart. We are highly instrumental in presenting a wide spectrum of Direction Signs and Signage Letters that are extremely reliable.